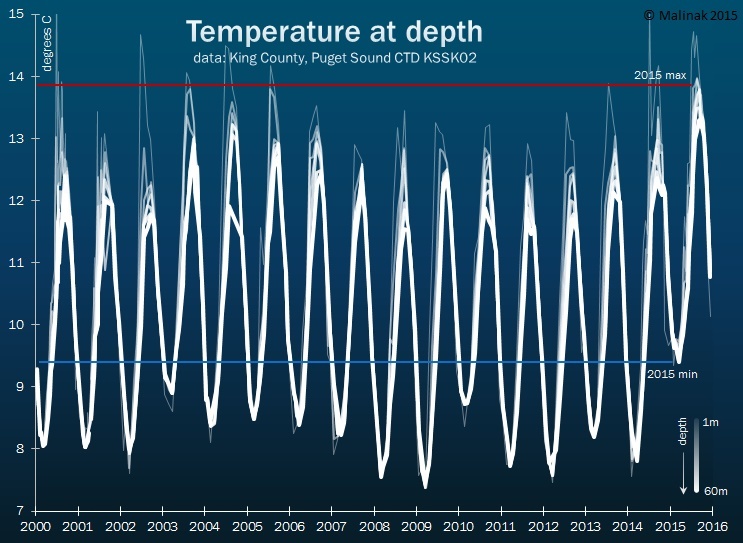 Once or twice a month, the folks at King County Department of Natural Resources and Parks send a boat out onto Puget Sound, drop some instruments to the bottom, pull them back up, and then do this again somewhere else. A full description of CTD sampling methods is available at King County’s Marine Monitoring website. The data they collect from this sampling is publicly available and I’m sure is put to good use, but I’ve never come across any of it in a presentable format. So with Excel and some free time, here is a snapshot of the around 370,000 data points at three locations taken over the past 15 years. It looks like King County offers fifteen CTD locations, but since I don’t have all the time in the world, I only looked at the three I found most interesting (i.e. closest to Alki Beach). 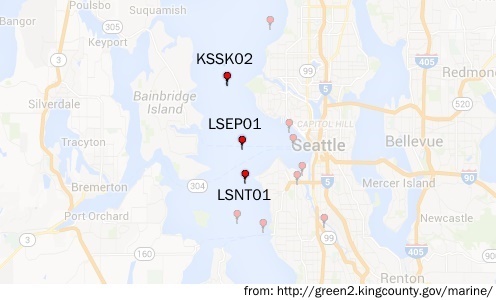 Stations LSEP01, LSNT01, and KSSK02 are shown below. The CTD data is recorded every half meter, both on the trip down to depth and the trip back to the surface. In addition to temperature and depth, King County records conductivity, dissolved oxygen, light transmission, and chlorophyll. But again, limited time, limited resources, so I’m only looking at temperature. A temperature profile over the past five months is shown below. At the surface, water cools and warms quickly while the temperature the bottom trails slowly behind. 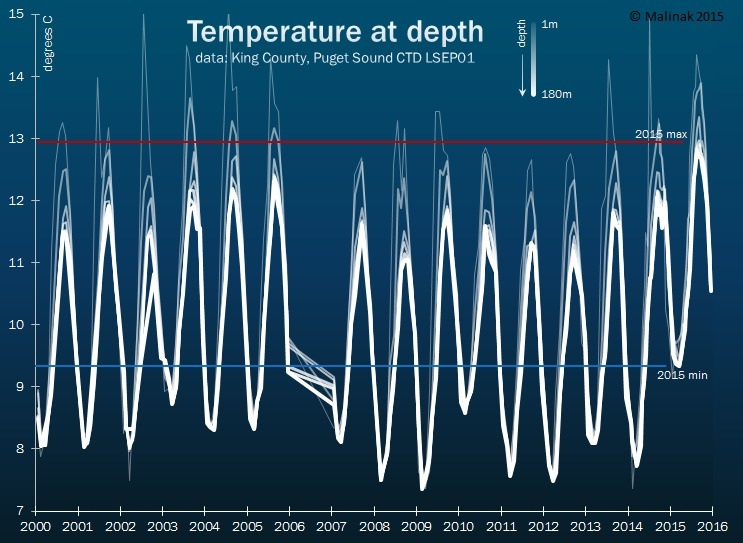 Temperatures at depth peaked this year in late August or early September. We’re now in the annual cooling-off period, with surface temperatures this week getting below 10C. 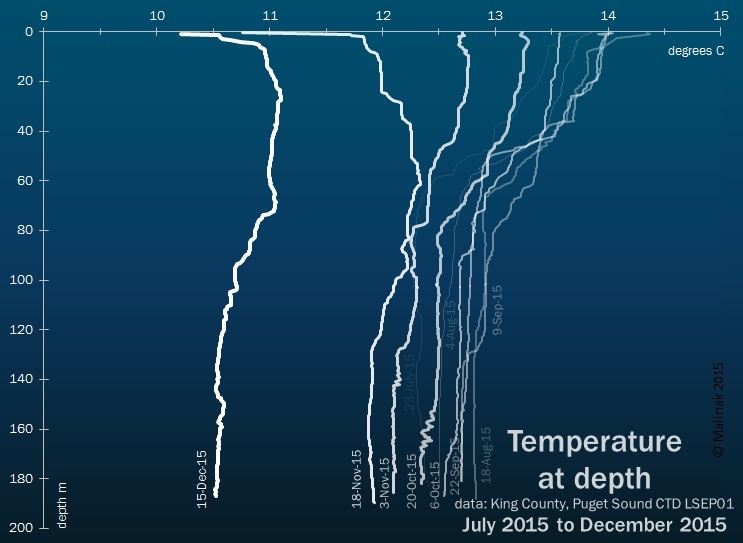 Early March is when coldest temperatures are found at depth. Because of the fickle nature of surface temperatures, let’g almost totally ignore them. 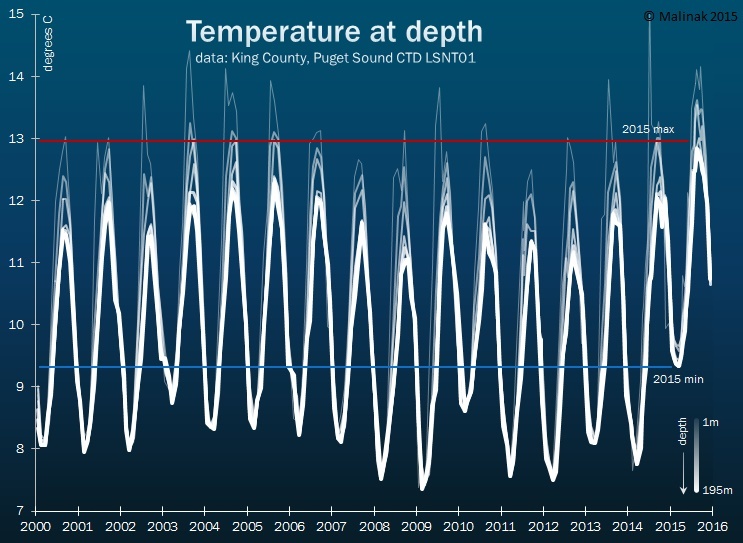 Instead, lets give some emphasis to the stable, plodding temperatures down towards the bottom of the Puget Sound. What are they up to? At all three locations, 2015 has had the warmest maximum and minimum temperatures of the past fifteen years by around one degree C. No wonder swimming felt so nice. For the record, the data goes back to 21 October 1998. Why did I stop at the beginning of 2000? Well, I just forgot to, and ran out of time. The data is there if you want to look at it. At LSEP01, it looked kind of like 2008. So what does this mean? What will this year be like? I don’t know and I don’t know. If you compare December temperatures to the rest of the year, there isn’t much of a pattern. A warm or cold December seems to have little correlation to winter lows, and even less to the next summer’s high. So what does the future hold? My guess is that the temperatures in March will be a smidge colder than last year’s, but I’m not a magician. We’ll just have to wait and see.